I visited Copenhagen three years ago in the winter of 2009. It was cold, it was stylish, it was expensive. This time it was different, at least in terms of temperature and general vibe. As with all the Scandinavian cities Copenhagen truly comes to life in summer. There’s life on the streets, bicycles bustle back and forth and terraces are packed never mind insane prices. Combine this with the stylish architecture and the famous Danish design and it almost made me to move here. I longed for a company, but the days of “forestation” had left a mark. I felt lonely in the city full of people. Urban alienation at its best (or worst). I was not mad enough to strike conversations with random strangers. So I spent time cycling around admiring the excellent cycling infrastructure and pretty buildings. Cycling in Copenhagen is an experience itself. Bicycles are of all forms and shapes, can be found everywhere and thanks to the flat landscape they move fast. There is no room for solo cruising or interpreting try traffic laws in a creative manner here, you are part of the traffic. Rules are to be obeyed and your manoeuvres to be advertised using hand gestures. An intense experience, which requires your undivided attention, just like driving a motorbike in Vietnam. I went to Christiania in the morning, but found only an unkept and messy area. Just llike a hippy commune that has not be cleaned up for ages, a strike contrast with the rest of Copenhagen. In the evening I rendez-voused with Teppo and I got the company I had longed for. We talked and the signs of the untalkative mood were completely gone. It is so true that in order to get into a talkative mood you just have to start talking. 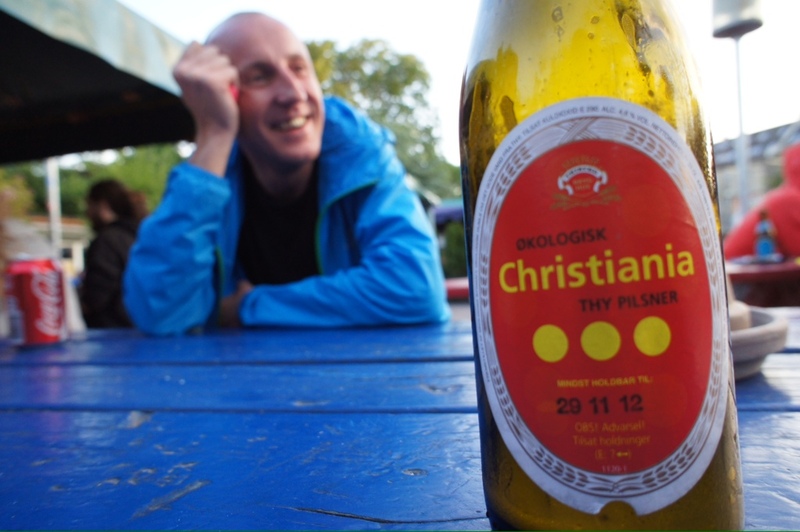 We visited Christiania again and this time it was full of people and there were no signs of the dirty hippy commune I had found in the morning. Just warm, laidback and cozy atmosphere. I stroke conversations with strangers and asked for tips on what to see in Copenhagen. Invariably the answer was always the same: Christiania. Well, there are definitely other worthy things to see in Copenhagen (the Little Mermaid status is not one of them, though), but Christiania is a truly liberal oasis in the heart of Scandinavian order and structure. I enjoyed Copenhagen a lot and wished I would have spent more time there, but once again the journey had to be continued towards Germany and Fusion. Copenhagen to be filed under the “to visit again” category.